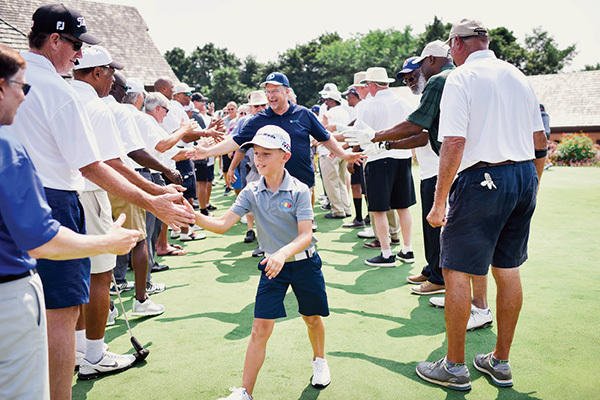 Guests run through a tunnel of NFL Hall of Famers at the 2018 NPH Legends Golf Classic. Barrington area residents gathered last August to support NPH and enjoy a day of golf and mingling with football legends. NPH USA supports “Nuestros Pequeños Hermanos” (NPH, Spanish for “Our Little Brothers and Sisters”), a nonprofit that is raising and caring for more than 3,100 orphaned, abandoned, and disadvantaged boys and girls in Bolivia, the Dominican Republic, El Salvador, Guatemala, Haiti, Honduras, Mexico, Nicaragua, and Peru. An additional 3,100 children who live outside the NPH homes receive education, scholarships, meals, and health care. Residents of the Barrington area partner with NPH for its exciting NPH Legends Golf Classic each summer. Planning for the 2019 event is now underway. Sponsors, golfers, guests, and friends are encouraged to participate in this one-of-a-kind-event each summer. This year, special guest Bob Costas, legendary NBC sportscaster, joined the all-star group as an emcee for the program after a day of golfing, a silent auction, and dinner. The 2018 Legends Golf Classic had 250 attendees and together, the guests, golfers, and some of the greatest football players in the sport’s history, met the goal of raising $225,000. Joining the NPH event were 22 Former NFL Football Players—nine of them are in the NFL Hall of Fame. Five are former Chicago Bears players. Each foursome that participates has an additional player that makes up a “five-some” to play golf with. The additional person is a former NFL Football Player, half of whom are NFL Hall of Fame members. The plans for the 2019 NPH Legends Golf Classic are not finalized yet. “New involvement with companies and organizations and new opportunities at the event are very much anticipated and are welcomed,” NPH Development Officer Ron Rado says. The 2019 NPH Legends Golf Classic will be held on Monday August 12, 2019 at The Biltmore Country Club. To learn more, contact NPH Development Officer Ron Rado at 312-985-7060 or email: rrado@nphusa.org. To learn more, visit www.nphusa.org. These NFL Hall of Fame players and former Chicago Bears offered their support at the 2018 NPH Legends Golf Classic in Barrington. Quintessential America™ is a recurring series of stories reflecting American values and community achievement. Some will be big stories. Some will be small. They’ll all be about Americans doing what we do best — sharing, helping, living.